Sara, marching behind a nun, at the State Capitol. She is a Canadian, and she had come to the Rio Grande Valley with eight other colleagues to see what she could learn about how our community cares for its children. She is a physician, and her life’s work is to care for others. In her case, she carries a special interest in the poor and to the little ones—those who are “other” in our health care system. Sara is also a faithful Muslim woman, someone who each day wears a hijab, a veil, which covers her hair. 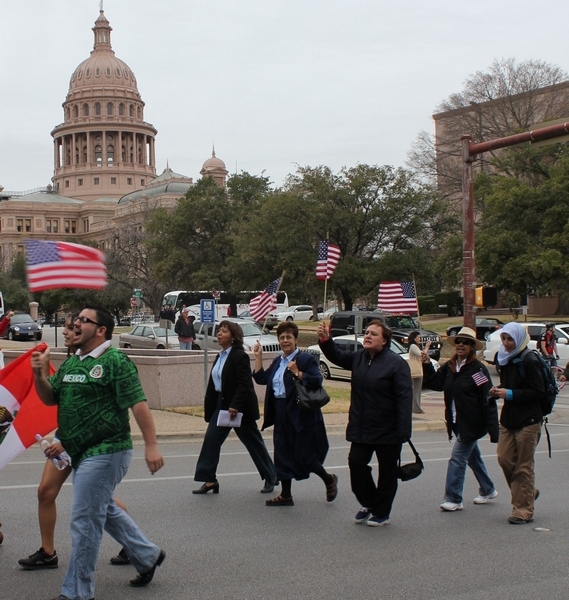 Last week, we traveled together to Austin, to participate in a march protesting Texas’ pending anti-immigrant legislation. It was 4am when we hit the highway in Brownsville, aiming to join the march by noon. “OK,” she echoed, and for the next five hours we talked about God and faith and community, about mercy and forgiveness, about hard choices and fundamentalists. We covered prayer and fasting, the Muslim restrictions on interest (on loans) and its insistence on charity. The conversation circled again and again to the basic tenet of religious faith—it is love in action that frees us from ourselves, and brings us peace. I submitted myself, rather irreligiously, to total body fright, as she cut across two lanes of traffic and settled into the last part of the drive. When I recovered my breath, I asked her about women’s role in Islam. I discovered that Sara talked the same way that she drove—quickly and daringly. Unlike her driving, which had made me think about whether or not my will was up to date, the conversation with her left me thinking about life and all of its possibilities. We made it back to Brownsville; Sara and her colleagues finished up their work and their month-long coursework. They were impressed by the solidarity in the border communities, worried about children held in detention, overwhelmed by the need and the lack of resources. It seemed to me, as well, that they had fallen in love with this corner of the United States. Sara was the last one to depart. As she approached airport security, she realized that she was going to have to submit to the indignity of the body scan machine. Like everyone else that was traveling that day, she was electronically strip searched. Sara’s one consolation was that she would, at least, be spared the shame of being patted down. But no, her silken-polyester veil, although worn as an effort at modesty, and as a sign of respect for others, made her “other”, and, therefore, suspicious. She was pulled out of line. Her head was patted down, a silly, demeaning act, given that the scanner had already searched her entire body. There were no scanner-invisible weapons concealed under her scarf, and Sara was allowed to head home to Canada. The lessons of that experience would take hours to tell, and I pray one day to get to have that conversation with her.